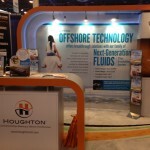 OTC, Offshore Technology Conference, is officially over! 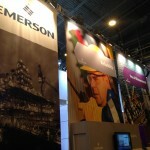 If you have never heard of this tradeshow, it is time to get out from under the rock. The results for the 2015 show are in: There were more than 94,700 attendees from 130 countries gathered at the annual conference. What’s even more incredible is that there were 2,682 companies exhibiting! 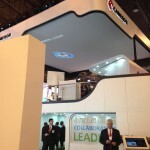 BOOTH FEATURES THAT ACTUALLY WORK! Lights, Lights, Lights: Yes, they cost extra, but man do they work! 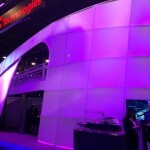 Make it white, make it blue, make it purple, whatever you prefer- but NEVER skimp on lighting in your booth. Our favorite? 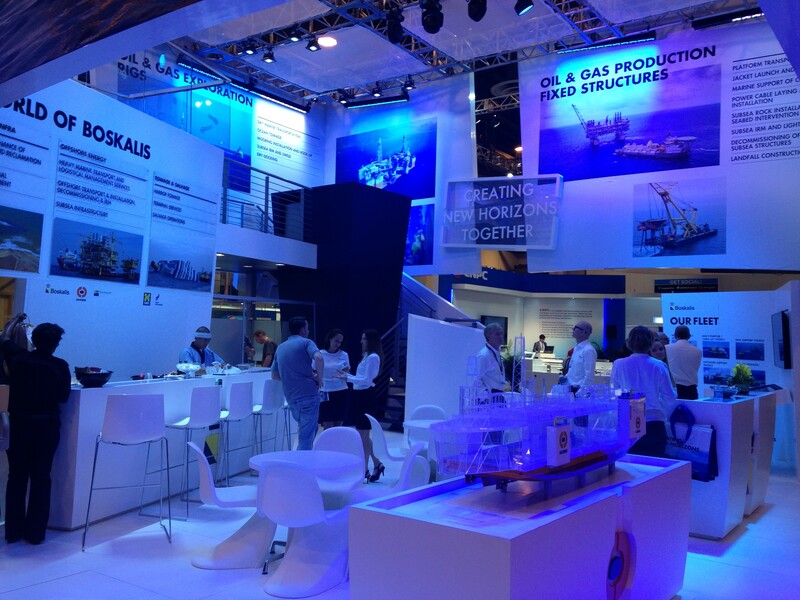 The Boskalis booth that beamed blue light for miles! 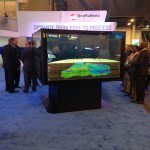 Go BIG or Go Home: Not referring to booth size, but to GRAPHIC size. It is common to want to cram in all your information and products into one graphic, but having one large picture is much cleaner, professional, and sends a more uniform message. Our favorite? The mhwirth booth had people stopping and interacting. Direct Traffic: Create a flow in your booth. Yes, you want people to enter your booth, but then you want to control their experience, show them specific areas of your booth, and not create a traffic jam. How do you do this? 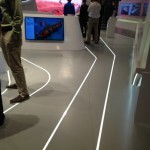 Simple lines and lanes on the carpet of your booth allow this flow to happen naturally! Our favorite? 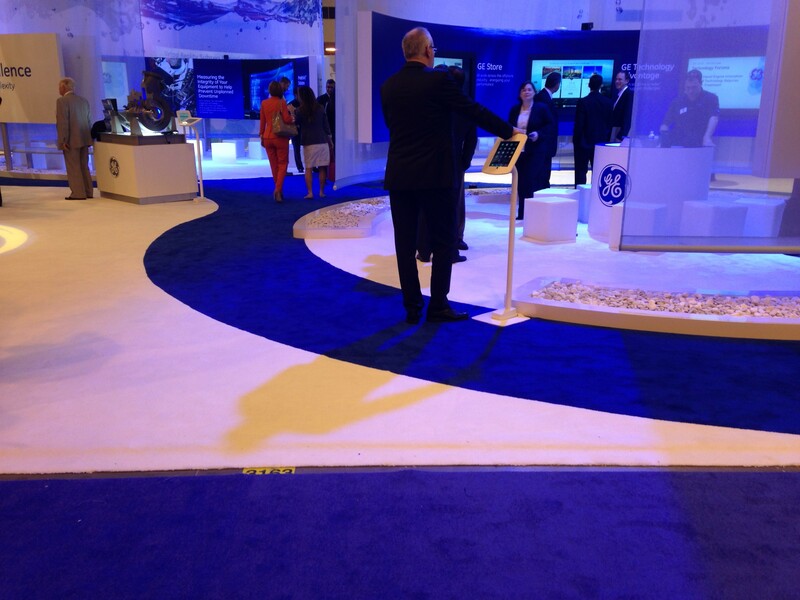 The GE booth almost had people walking single file at times! 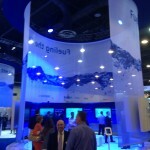 Heads up: Utilize the space ABOVE your booth! Create unique hanging signs (or objects) to divert attendees’ attention from “people-watching” on the floor to admiring your company name! And not to mention, it is proven that when people have their head lifted high, they naturally become happier! Perfect prospects! Our favorite? 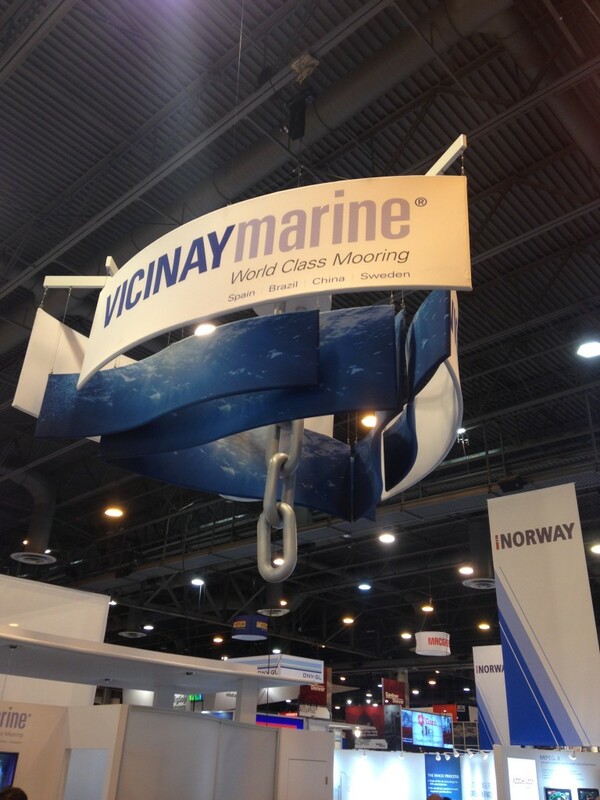 The Vicinay Marine booth had us mesmerized AND communicated the line of work they do! Be Different: Don’t have a big budget? 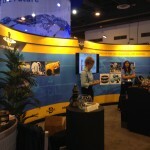 Working with a 10’x10’ booth and want to stand out? Try curved corners or abnormal shapes. People get used to corners and straight edges and tend to stop when a shape is different. Utilize this in your booth structure! Our favorite? 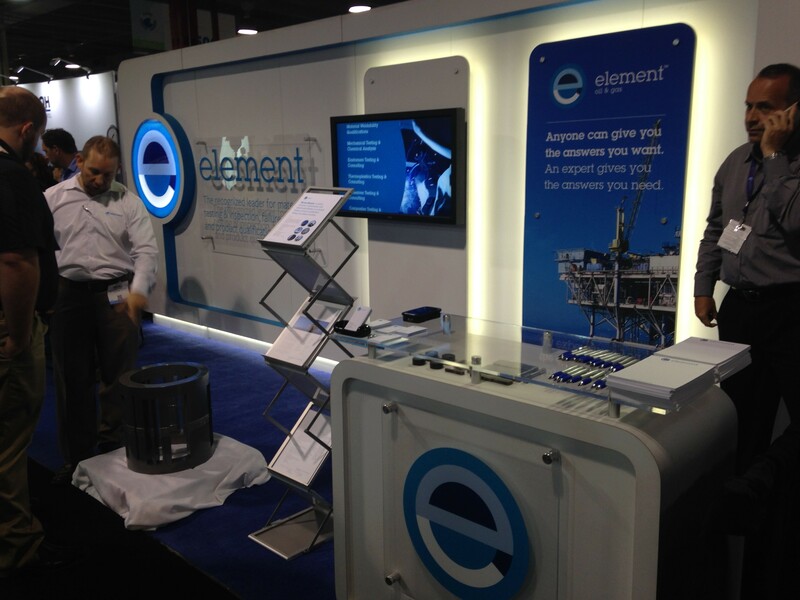 The element booth was clean, unique, and very professional looking- enough to get us to stop! 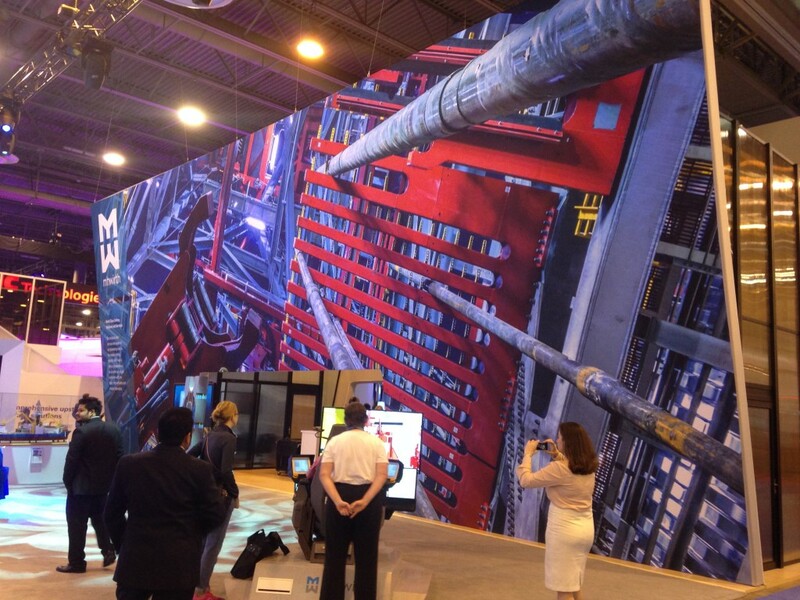 Hopefully you have received a few takeaways for enhancing your next “show stopping” booth. Need help? We are always here for you.